Ethiopian Airlines is African Business of the Year. Boeing Delivers Ethiopian Airlines‘ First 777-300ER 777-300ER to provide Ethiopian flag-carrier with additional capacity on key routes. Boeing (NYSE: BA) has delivered a 777-300ER (Extended Range) jet to GE Capital Aviation Services for lease to Ethiopian Airlines. The 777-300ER is now the largest airplane in the Ethiopian flag-carrier’s fleet and will provide it with increased capacity and improved operating economics on key routes from its base in the Ethiopian capital, Addis Ababa. “The introduction of the B777-300 ER into our fleet is a major milestone, as it will be our biggest aircraft with a 400 seat capacity. Ethiopian B777-300 ER will give our passengers the best possible travel experience with its spacious cabin interior, high ceiling, advanced in-flight entertainment system, increased stowage capability and additional cargo uplift flexibility. The aircraft will be deployed on our long haul non-stop routes to the US and China and will give us exceptional range capability and fuel efficiency.”, said Mesfin Tassew, Chief Operation Officer of Ethiopian Airlines, who took delivery of the aircraft. Ethiopian’s first 777-300ER will seat nearly 400 passengers in a two-class configuration and perfectly complements its existing fleet of six 777-200LR (Longer Range) airplanes by providing additional capacity and flexibility on popular routes, such as Guangzhou, Washington, D.C. and Dubai. In future months, an additional three 777-300ERs with join Ethiopian’s continuously expanding fleet, providing the Addis Abababased carrier with more options on new and existing routes across Africa and beyond. 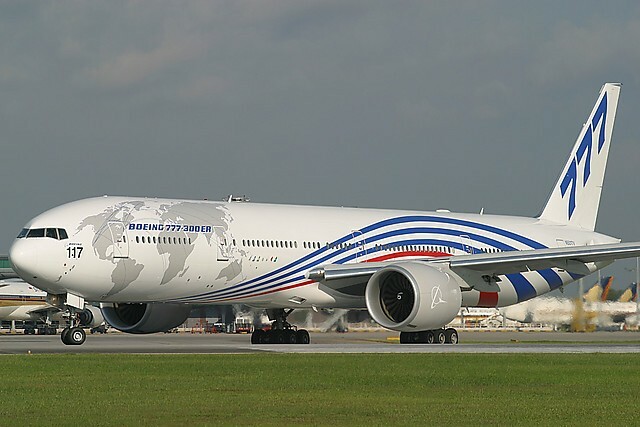 The 777-300ER can fly up to 7,825 nautical miles (14,490 kilometers) and is equipped with GE90-115B engines, the world’s most powerful commercial jet engine. Ethiopian’s 777-300ER also features the Boeing Signature Interior that offers wider seats, wider aisles, more headroom and more seating flexibility. Ethiopian currently serves 76 destinations across five continents and was recently awarded African Business of the Year at the annual African Business Awards. The carrier’s partnership with Boeing stretches back over six decades, with a current fleet of nearly 50 Boeing airplanes that includes Next-Generation 737s, 757s, 767s, 777s, and 787 Dreamliners and a cargo fleet that includes 757s, an MD11 and 777 Freighters. Posted on 12th November 2013 by newsafrica. This entry was posted in Africa, Ethiopia, Headlines and tagged Addis Ababa, Africa, Boeing, Boeing 777, Breaking News, Economy, ER, Ethiopia, Ethiopian Airlines, Flag of Ethiopia, GE Capital Aviation Services, Headlines, Investment, Strategy, Tourism. Bookmark the permalink.